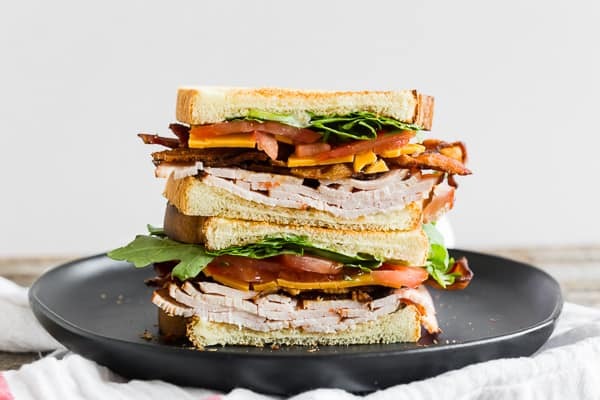 This turkey and cheese BLT sandwich is the perfect back to school sandwich. 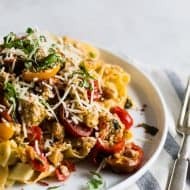 It combines lightly toasted bread with a homemade garlic basil mayonnaise, sliced turkey, sharp cheddar cheese, crispy bacon, sliced tomato and baby arugula. 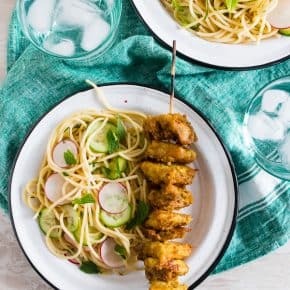 It’s flavorful, easy to make and a step above your everyday bagged lunch sandwich. This post is sponsored by Sara Lee® Bread. All opinions are 100% my own. When I was in high school I packed my own lunch. I mean, of course, I packed my own lunch. I was a teenager BUT I just meant I had all the control. All. Of. The. Control. That meant I was not going to make just normal everyday sandwiches. Nope. In fact, even now as an adult I HATE eating boring sandwiches and refuse to eat the same thing day after day. 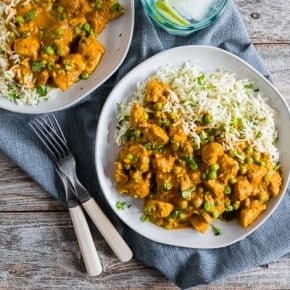 You know those questions where they are all “If you could only eat one food for the rest of your life what would it be?” Well, my answer would be “NO I REFUSE TO LET THAT HAPPEN TO ME I HAVE TO EAT DIFFERENT THINGS every day!” I would definitely say that yelling too because I couldn’t handle the same food for forever. Well, I could maybe eat bread but I would still be dreaming of chocolate. And pie. And steak. And corn on the cob. And salad. 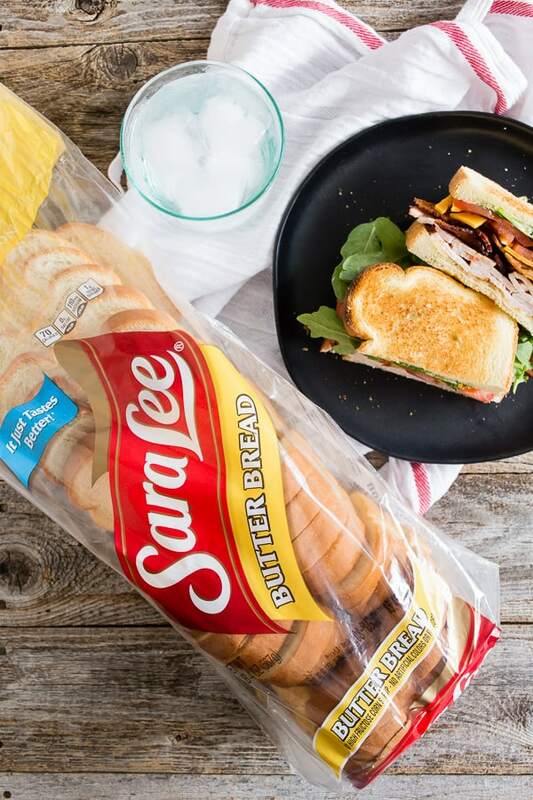 When Sara Lee asked me to team up with them to create a perfect back to school recipe, my response was “YES I WILL DO THAT!” in 2.2 seconds. Making back to school sandwiches is my jam. I know I don’t have kids but I was once a kid (who took making lunch VERY seriously) and was a nanny for 12 years. I have made enough sandwiches to maybe even call myself a pro. 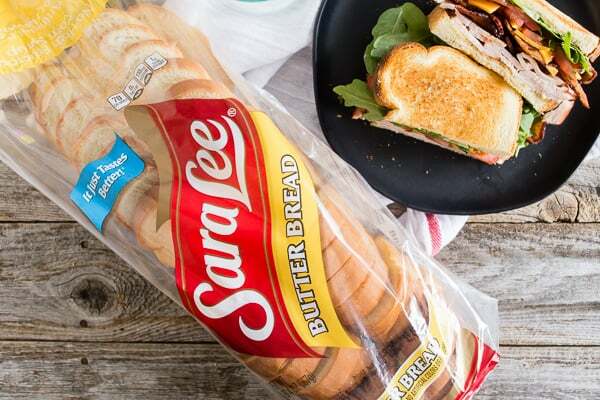 PLUS who wouldn’t want to make a sandwich using the amazing Sara Lee® Bread? Not only does it smell amazing but it’s so soft (my favorite bread trait!) and has no high fructose corn syrup, no artificial colors or flavors, 0g trans fat and it’s low fat and cholesterol free! That means you get all the flavor of butter in your bread with all that goodness – YES! FYI – turkey and cheese BLT sandwich with butter bread is my new favorite combo EVER! Rewinding back to high school lunch packer Brandy, we’re going to go back to this turkey and cheese BLT sandwich. I was HUGE on making delicious sandwiches complete with tons of snacks and a decorated brown paper bag. Yes, I would decorate my bag each and every morning. Some days it was geometric shapes, some days its movie quotes one day it a complete drawing of the Titanic Jack/Rose wooden board scene complete with diagrams showing how they could both have fit on the board. I’m not going to get angry over a fictional film BUT she could have made room. It’s all I’m going to say. Ok, one more thing. She really really really could have made room and she let go! She promised she wouldn’t let go! Plus, why throw the jewel over the boat? Give it to the granddaughter. Ugh. Ok, I’m really done this time. If you’re not a fan of toasted bread this turkey and cheese BLT sandwich is equally delicious on nontoasted bread. It’s the perfect combination of textures and the flavor-packed mayonnaise is one of the best parts. Now, while I may not have made my own flavored mayonnaise in high school I think you should definitely do it for your kids. It’s so dang good. I know, I’m getting a bunch of moms thinking “Yeah, like I have time to make homemade flavored mayonnaise.” I get it. But, if you do have the time it’s worth it. As a nanny, I didn’t have time either. Kids can be super draining. I also love the play on a classic BLT in this sandwich. Since bacon is more fat than protein I wanted to make a sandwich that still allowed me to enjoy my bacon but actually get some protein into my lunch sandwich. And if you’re like me you always have a little deli meat (I like to call it lunch meat but here in New York people find it weird that I say that….?) sitting in the fridge waiting to be used so it’s the perfect addition. 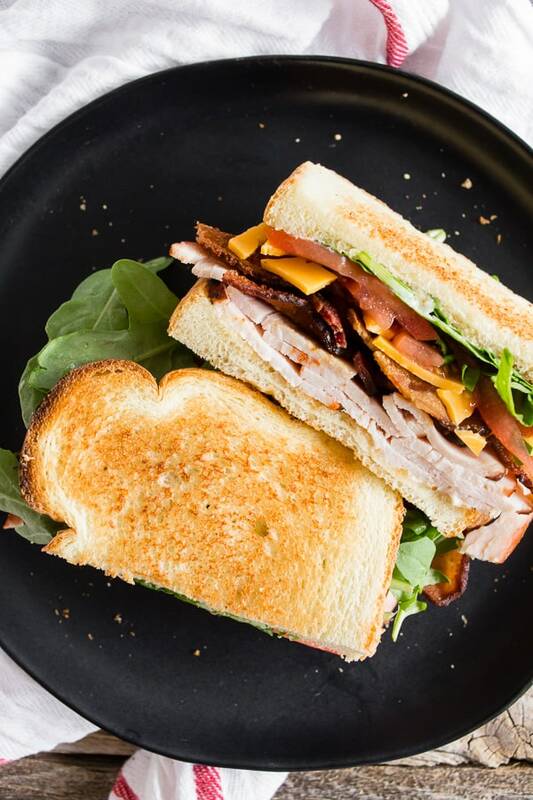 This turkey and cheese BLT sandwich is the perfect back to school sandwich. 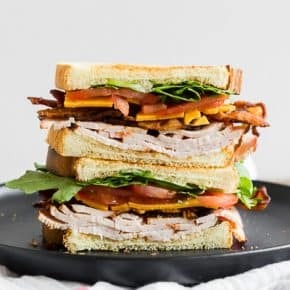 It combines lightly toasted bread with a homemade garlic basil mayonnaise, sliced turkey, sharp cheddar cheese, crispy bacon, sliced tomato and baby arugula. 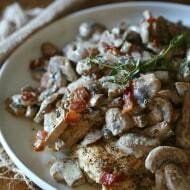 It's flavorful, easy to make and a step above your everyday bagged lunch sandwich. 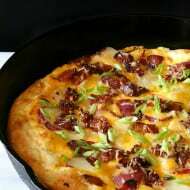 Lay out toasted bread and spread a thin layer of mayonnaise on each slice of bread. 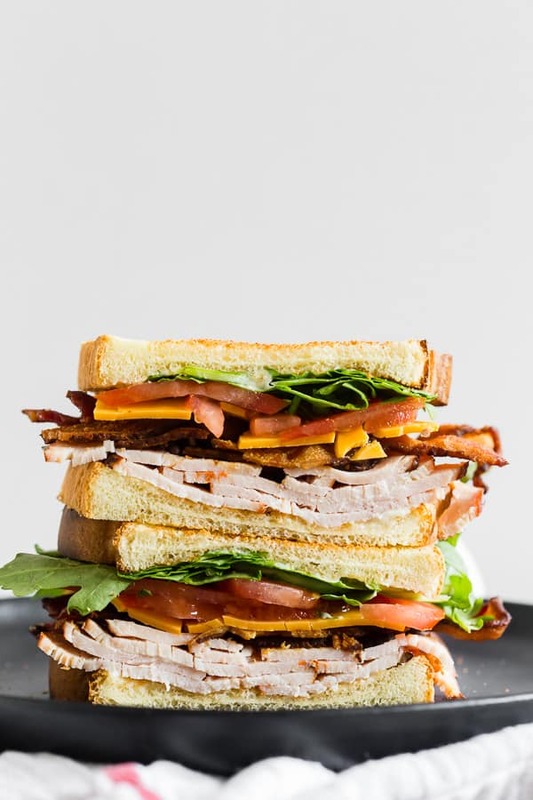 On one slice of bread add the turkey, bacon, cheddar cheese, tomato slices and baby arugula. Top with remaining slice of bread and enjoy. 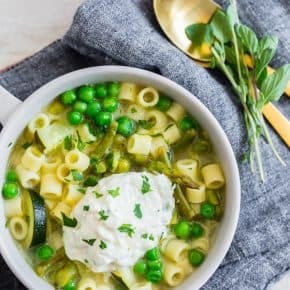 Add all ingredients to a small bowl and mix together until fully combined. 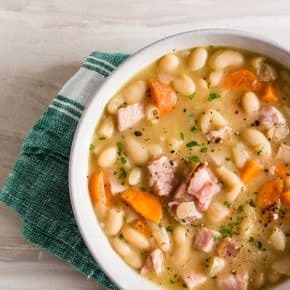 I have a ton of turkey and bacon sitting in my fridge right now, so I know what I’m making for lunch! That is a delicious looking sandwich!! 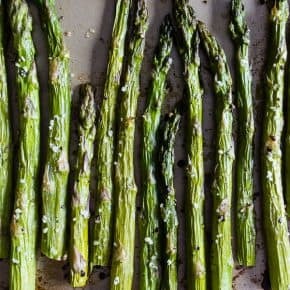 I want to slather homemade garlic basil mayonnaise on everything! I’m always game for a a sandwich that has bacon, haha! Sounds like I found my next lunch! I love how fully loaded this sandwich is! Pile on the goodness! Now that is my kind of lunch sandwich! 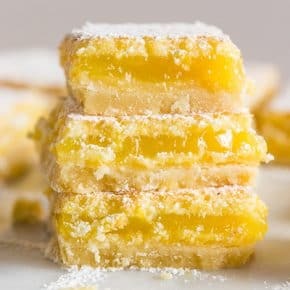 Just look at those layers! So yummy! Nothing like a good BLT! This is like the ULTIMATE sandwich with that bread! This is the way to make a sandwich! I love this aoili to put on many things too!